Good decision. hOWEVER, WHATEVER LITTLE EXPERIENCE i HAVE OF bLOGGING, i WOULD SUGGEST TO PLEASE KEEP WRITING AND FORGET ABOUT WHAT PEOPLE ARE SAYING OR HOW SOMEBODY WILL REACT. THIS IS WORLD OF YOUR OWN. IT IS THE SAME WORLD AS THAT OF YOUR THOUGHTS IN YOUR MIND.NOBODY INTERFERES IN THEM EITHER. THE ONLY DIFFERENCE IS THAT YOU ARE THINKING LOUDLY. THIS IS A WAY OF OOZING OUT THE ORIGINAL FEELINGS. PLEASE TRY NOT TO MIX ANY ARTIFICIAL FEELINGS AND YOU WILL ENJOY. I HAVE BEEN FOLLOWING YOUR POSTS ON THE NET AND I KNOW YOU ARE A BRAVE GIRL. SO WELCOME ABOARD SRI LANKAN. thank you so much so all these words of encouragement..thank you for being with me in this and i fully agree with you . You are right again , when you say that this is my world and the difference is i'm the captain of my ship and my duty is to take this ship safely to its final destination . 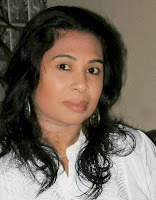 I hope my voice will be heard around the world and it's time that Sri Lanka should be in blogging more. i went through your blog and find it very interesting. I don't believe that you are such a new person in blogging...Great Job! Thank you for visiting my blog ...i started my blog just 2 months ago and i think i'm still learning ....i'm very new to this blogging world coz 8 months ago when Javed Shirazi introduced me to blogging i didn't know what it is ..but today this blog is my life and i love it so much ...thank you for your wonderful encouraging words .